1 Month Count Down to MI Walk! It's so exciting to think that in just 30 days Amelia, Tomi and I will be walking 60 miles in the Michigan 3Day walk! It's long overdue, but here's a picture from a fundraising event we did together earlier in the year at Coldstone Creamery! 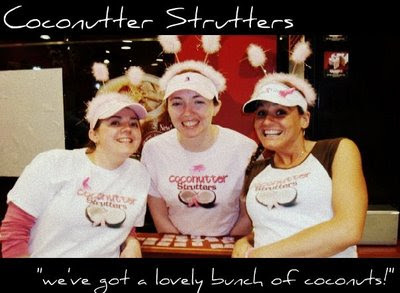 Thanks to everyone who came out for some ice cream made (well, mushed and mashed and smooshed) by the Coconutter Strutters! begins at 6:30 am at The Henry Ford 20900 Oakwood Blvd. Dearborn, MI 48124 on Friday, August 14th. will be at 4:30 pm at Washtenaw Community College 4800 E. Huron River Drive Ann Arbor, MI 48105 on Sunday, August 16th. I'll post the cheering stations soon, but if you can't make it out to the east side of the state to cheer us on you can send us snail mail! As always, thank you for all of your support! We couldn't do this with out you!